“Due to the fact that Democrats are unwilling to change our very dangerous immigration laws, we are indeed, as reported, giving strong considerations to placing Illegal Immigrants in Sanctuary Cities only,” opined President Trump on Twitter this Friday (in case you someone missed it). Pandemonium predictably ensued, Save Jerseyans! 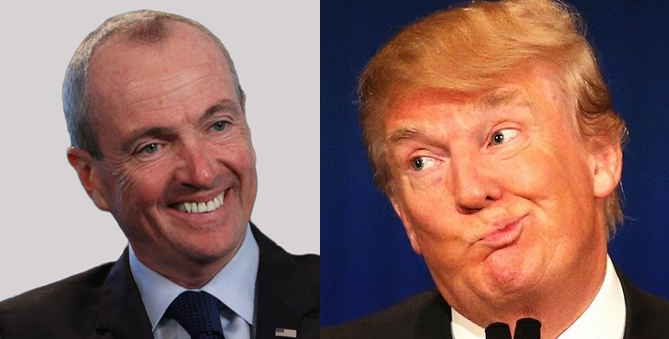 Naturally, after hearing about Trump’s latest and most dramatic-to-date challenge to sanctuary jurisdictions, I immediately checked out New Jersey Governor Phil Murphy’s social media channels/platforms to see if he’d either criticized the President (which he prefers to governing) OR jumped at the opportunity to receive so many new illegal residents. Late last year, the Democrat governor’s administration infamously declared a sanctuary state in New Jersey (which just took effect). He openly supports driver’s licenses for illegals without much in the way of identity proofs to safeguard our citizens from bad actors abusing the system. He spearheaded in-state tuition for illegals AND taxpayer-financed legal aid for illegals facing deportation. When he was running for governor in 2017? Murphy went as far as to say he’d be ‘biased’ in favor of protecting illegal aliens, even those accused of committing crimes. Murphy isn’t pro-immigration or even pro-amnesty. He’s anti-citizenship, borders, and rule of law. If you want to come here? Com’on in, even if you’re a criminal convicted of or wanted for serious crimes (ICE has rounded up hundreds hiding in New Jersey in recent months). No no rules, no line, no waiting, and you WILL have the benefits traditionally accorded only to citizens who pay taxes. Look: I certainly don’t want Trump dumping extra illegals in New Jersey. I would oppose that. I hope (and suspect) he’s just trying to make a point in typical Trumpian fashion which is characteristically anything but subtle. But what a point it is! And the reactions (or lack thereof) to Trump’s probable thought experiment on steroids from his most vocal critics are extremely revealing. Accepting Trump’s offer would prove that this isn’t about immigration but politics, lawlessness, and an extreme ideology that’s out of the mainstream, even here in the Garden State. Take note, and be sure to share this post with a persuadable voter heading into this year’s critically-important Assembly elections. Trump just threatened to bus every illegal immigrant over to California's sanctuary cities.